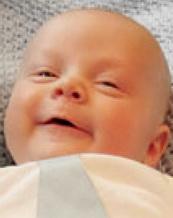 WATERLOO — Luke Eugene Shafer Aronson, 3 months, died Wednesday, July 17, 2013, at the University of Iowa Hospitals and Clinics, Iowa City. He was born April 20, 2013, in Waterloo, the son Brian and Tiffany Shafer Aronson. Luke enjoyed long walks with his Mom and spending time outside with his Dad. He told everyone long stories of his adventures. He loved play dates with his two cousins and his “Best Friend” Scout. Survivors include his parents, Brian and Tiffany of Waterloo; paternal grandparents, Larry and Connie Aronson of Albert City; maternal grandparents, Dale and Deb Shafer of Monona; paternal great-grandparents, Eugene and Beverly Sandvig of Marathon; maternal great-grandparents, Mark and Margaret Delaney of Harpers Ferry; three uncles, Andy (Lindsey) Aronson of Hudson, Kyle (Becca) Aronson of Cedar Falls and Brad Aronson of Albert City; an aunt, Stacey Shafer of Des Moines; and two cousins, Camdyn and Brant Aronson of Hudson. He was preceded in death by paternal great-grandparents, Martin and Darlene Aronson; and maternal great-grandparents, Ralph and Betty Shafer. Services are 11 a.m. Tuesday, July 23, at St. Patrick Catholic Church, with burial in Greenwood Cemetery, both in Cedar Falls. Public visitation from 4 to 7 p.m. Monday at Hagarty-Waychoff-Grarup Funeral Service on West Ridgeway, Waterloo, where there will be a 7 p.m. vigil service. Visitation also one hour prior to services Tuesday at the church. Words cannot describe the happiness that Luke brought to us. His personality, along with his contagious smile brought joy to everyone that met him. We love you sweet Luke, rest peacefully.